To understand what a Children’s Advocacy Center (CAC) is, you must understand what children face without one. Without a CAC, the child may end up having to tell the worst story of his or her life over and over again, to doctors, cops, lawyers, therapists, investigators, judges, and others. They may have to talk about that traumatic experience in a police station where they think they might be in trouble, or may be asked the wrong questions by a well-meaning teacher or other adult that could hurt the case against the abuser. When police or child protective services believe a child is being abused, the child is brought to the CAC—a safe, child-focused environment—by a caregiver or other “safe” adult. At the CAC, the child tells their story once to a trained interviewer who knows the right questions to ask in a way that does not not retraumatize the child. Then, a team that includes medical professionals, law enforcement, mental health, prosecution, child protective services, victim advocacy, and other professionals make decisions together about how to help the child based on the interview. CACs offer therapy and medical exams, plus courtroom preparation, victim advocacy, case management, and other services. This is called the multidisciplinary team (MDT) response and is a core part of the work of CACs. What Is the National Children’s Alliance? NCA is the national association and accrediting body for a network of more than 850 Children’s Advocacy Centers—CACs. We provide support, advocacy, quality assurance, and national leadership for CACs, all to help support the important work that CACs do in communities across the country. CACs provide a coordinated, evidence-based response to children who have been abused in all 50 states. 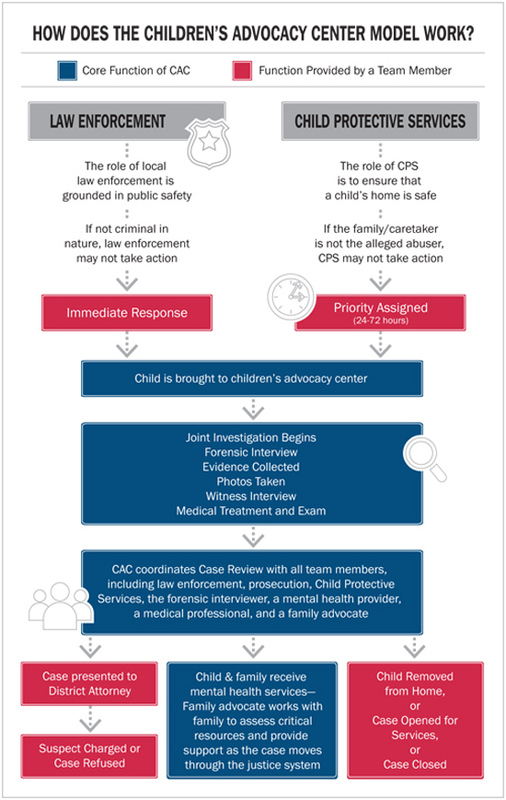 For more detail, see this flowchart of how children and families go through the CAC investigation and intervention process and case decisions are made.